DETECTO’s new solo® eye-level clinical scale is the most economical, high-quality digital physician scale with height rod available. 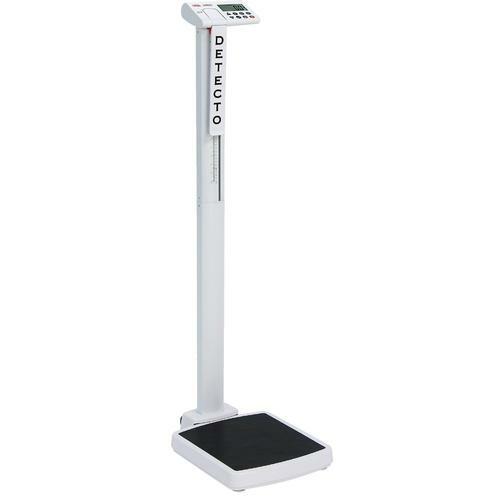 The solo® scale features 550 lb x 0.2 lb / 250 kg x 0.1 kg capacity, 14 in W x 15 in D x 2.4 in H low-profile platform, inline mechanical height rod, eye-level weight display and column, one-inch-high LCD readouts, Body Mass Index calculation, integral wheels for mobility, one RS232 serial port, and convenient audible beep confirmation. DETECTO’s new solo® eye-level clinical scale is the most economical, high-quality digital physician scale with height rod available. The solo® scale features 550 lb x 0.2 lb / 250 kg x 0.1 kg capacity, 14 in W x 15 in D x 2.4 in H low-profile platform, inline mechanical height rod, eye-level weight display and column, one-inch-high LCD readouts, Body Mass Index calculation, integral wheels for mobility, one RS232 serial port, and convenient audible beep confirmation. The solo® is powered by 6 AA batteries, which are included, or an optional AC adapter. The solo® indicator features 8 simple buttons that are easily identifiable in any language. The scale’s RS-232 serial port allows you to output measurement data to EMR/EHR software. Simply step on the scale to weigh and the scroll arrows let you rapidly enter your height to factor BMI. The mechanical height rod is situated to the side of the LCD, so it never interferes with viewing measurements. The oversized 14 x 15 inch platform with rubber mat is only 2.4 inches high making it easy for patients to step on and off. The AC port is located in the base, so no pesky wires dangle from up on the indicator (AC Adapter optional: model PD-AC).Two integral wheels allow for ease of movement whenever you need to transport the solo®. Six (6) AA size Alkaline batteries (included) OR an optional medical device 9V AC/DC wall plug-in adapter (Detecto part number PD-AC).